When it comes to social media, success can be measured in many different ways. The KPIs we use to gauge performance have a big impact on our ability to understand social media performance, and drive the direction of our social strategy. With the right measures of success, we can plot a social media strategy that continues to grow and return great results. 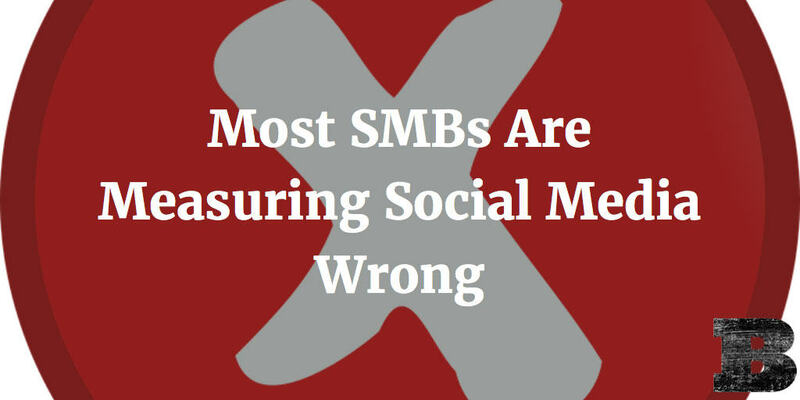 The problem is, most SMBs are measuring social media wrong. 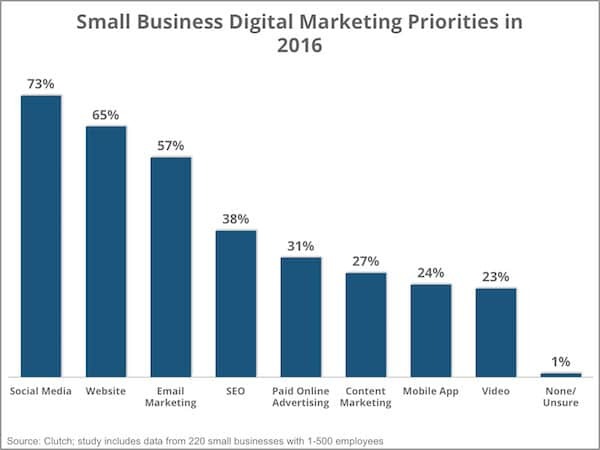 According to a recent survey by Clutch, small businesses currently rank social media as their #1 digital marketing priority. 73% of small businesses currently use or plan to use social media in 2016. That’s an even greater percentage than those that have a company website (65%). Let that sink in for a minute. Small businesses believe that social media is more important than something as basic as having a website. It’s clear that social media is seen as the biggest driver of business in the digital world for small businesses. It’s great to see small businesses put such great priority on the value that social media offers, but if you can’t measure it, you’re going to have a pretty hard time showing the efforts you’re devoting to social are returning anything. Sadly, only 11.5% of marketers can prove the quantitative impact of social media, according to a survey by Duke University’s Fuqua School of Business, the American Marketing Association, and Deloitte. 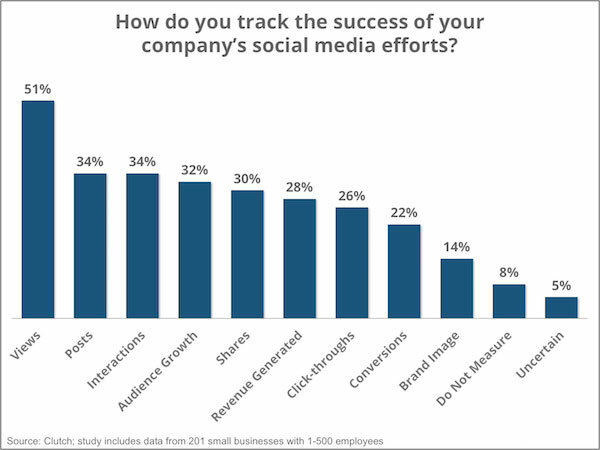 So how are SMBs measuring social media success? According to the same Clutch survey, most track success by views, followed by posts, interactions, audience growth, and shares. Alarmingly, 8% don’t measure and 5% aren’t even certain how to. While many of these metrics each give insight into the performance and even return from their social media efforts, many of those show that small businesses are measuring social media wrong. Measuring success by views may tell you how many people viewed what you posted, but does it really tell you if you were successful? Views alone tell very little about the impact of a social message. Were they views from the people that you wanted or just a bot clicking your links? A deeper dive is necessary to understand more about viewership and this metric alone doesn’t show success. Measuring posts as a metric of success is just silly. Do some honestly believe that they’re more successful if they post 10 times than if they post 5 times? If all posts were created equal and you got the same return every time this might be true, but in the real world it doesn’t work this way. There are countless other factors that impact the success of a post and post count alone has almost no impact on the overall success of your social media efforts. While it seems almost absurd to measure success in this manner, it’s scary to see that this metric is tied for 2nd as the most favored indicator of success for SMBs. Interaction and audience growth are good metrics to measure success by, but you’ll want to make sure you’re identifying who the interactions are from and insure that the audience growth is coming from people that fit within your target audience. Millions of interactions and huge follower growth means little if it’s from people or bots that will never show interest in what you offer. Social share count tell you little about the success of your social media strategy. Like posts, interactions, and audience growth, just because you saw millions of shares doesn’t mean they brought the desired outcome. Stop measuring success this way. Here’s an example of why shares are poor measure of success. As you can see below, this tweet seems super successful with 2194 retweets! But with just 25 clicks, the reality is that it failed to get people to carry out the intended action, which was to go and view the article in the message link. Success is defined by deeper metrics than simple social shares. As we can see, most SMBs are measuring social media wrong by choosing KPIs that tell them little about actual success. The right metrics to measure social success varies. There’s no ‘one size fits all’ system to gauging the performance of your social initiatives. Instead, you should first define the desired result of your particular campaign and messages, then match them to the metrics that will best show how your campaign achieved the results you were driving for. By picking more meaningful metrics to measure your social programs, you can gain a better understanding of where you hit and where you missed. This allows greater ability to identify where changes are required and will help you to see ways of gaining even better results from your social efforts. Stop measuring social media wrong. Identify KPIs that make the most sense for each execution and you’ll be on path to even better results from your social media investment.